The Revolutionary War shifted south in 1780, after the British capture of Savannah, GA in late 1778. This resulted in several battles throughout the Piedmont of North Carolina and the upstate of South Carolina. 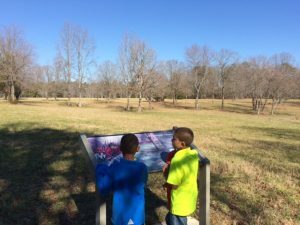 Many of these battlefields have been designated as National Military Parks and are within a two hour drive of the greater Charlotte area. 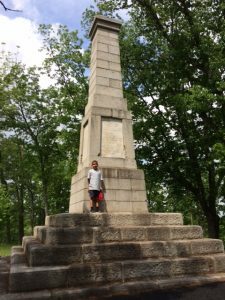 Visiting these parks has made learning about the Revolutionary War come alive for our boys. Because, war is interesting to boys! Looking out at Cowpens Battlefield. Our kids loved the Liberty Kids videos. 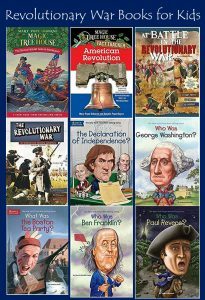 They provide 14 hours of viewing starting with the Boston Tea Party and continuing all the way through the writing of the Constitution. They can be purchased from Amazon or watched on youtube.com. Some libraries may carry them as well. We also watched the Sons of Liberty on the History Channel. Now this was a bit mature for them and we did have to fast forward through a “romantic scene”, but it generated good discussions and helped them visualize events that we read about in our books According to the History Channel web-site it is now available for purchase on Amazon. We also worked on a long term Lego project while I read the books using the measurements of the cabins at Valley Forge, 12 by 16 feet with a height of six feet. We used a scale of inch to one foot, which is a traditional scale for models, but we ran out of legos before the walls were high enough. We discussed perimeter and area as part of our teaching. Along the way, we also picked up a set of Revolutionary War soldiers that they enjoy playing with. We had actually moved on from studying the Revolutionary War when we started visiting the National Military Parks. We really just stumbled on the first one, but the boys loved it and now we try to fit in visits when we can. They typically contain a museum that teaches the specifics about that battle and how it fit into the war as a whole and outside trails that allow you to hike, do some nature study and visualize where the war took place. And of course, they have gift shops where we acquired our coloring book, toy soldiers and other historical toys and activities. Each of the National Military Parks have been free to visit. Guilford Courthouse National Military Park is in Greensboro, North Carolina and commemorates the battle fought there in March of 1781. It is very close to the Greensboro Science Center and we were able to cover both of these in a single day trip. It has both hiking trails and a 2.25 mile driving tour, with an audio CD to narrate available for purchase. This park contains many monuments, which our boys enjoyed. There is a small visitor center with exhibits and a 30 min. movie. There is also a 10 min. battle map program that our oldest enjoyed. Annual reenactments are performed each March. Cowpens National Military Park, 10 miles north of Cowpens, SC, is where Tarleton’s British forces were turned away by Morgan’s Riflemen in January of 1871. We parked at the Trailhead Parking Lot and hiked along trails to the visitor’s center. There are exhibits along the way that show how the battle played out. A key fact they teach is that a double envelopment was used, which has only been successful a few times in history. There is also a short driving loop and picnic areas. Inside are exhibits, a 20 min. movie, and a battle map program. There are living history exhibits on some weekends throughout the summer and fall and an anniversary celebration each January. Kings Mountain National Battlefield Monument is part of Kings Mountain State Park in upstate South Carolina. In October 1780, a short battle changed the course of the Revolutionary War in the south. I suggest starting with the 30 min. movie to learn the details of the battle before heading outside to the hiking loop that follows the lines the Patriot fighters formed around the base of the hill they would charge up. The hiking loop through the woods makes a great nature trail regardless of the historical significance. Along the trail are monuments. 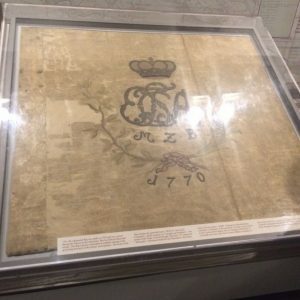 There are also exhibits inside the museum with some Revolutionary War artifacts. Many groups come together each October for an anniversary celebration. Yorktown Battlefield is part of the Colonial National Historic Park in Virginia. Yorktown was the battle that effectively ended the Revolutionary War in October of 1781, even though the Treaty of Paris would not be signed until September of 1783. We were able to visit it on a week long field trip, which included a few days in Colonial Williamsburg. Yorktown is only about a 20 minute drive from Williamsburg and makes for a great side trip. We took a guided tour (included in the entry fee), which led us outside for the tour guide to show us different cannons and explain how the battle played out across the York River and surrounding land. It actually started to snow on us, even though it had just been in the 80s two days before, so we headed back inside and toured the museum. This museum was much larger than the National Military Park museums we have been to and also had a short movie. We purchased the audio driving tour before we left the museum and drove to the various stops including a tour of the Moore House where the Articles of Capitulation were signed that outlined the surrender terms of Cornwallis’ army. This summer, we will be starting to visit some Civil War battlefields as we just studied that war this past school year. I am sure we will continue to stop at Revolutionary War battlefields as we stumble across them as the repetition helps cement the information in all of our heads!